As California Methane Leak Displaces Thousands, Will U.S. Regulate Natural Gas Sites Nationwide? | Democracy Now! 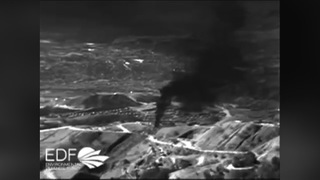 As California Methane Leak Displaces Thousands, Will U.S. Regulate Natural Gas Sites Nationwide? director of the Environmental Defense Fund’s Oil and Gas Program in California. president of Renaissance Homeowners Association, located just outside of the well site. He’s also a member of the Porter Ranch Neighborhood Council and board member of the Porter Ranch Neighborhood School. Today is day 84 of a runaway natural gas leak above Los Angeles that has emitted more than 150 million pounds of methane, described as the nation’s biggest environmental disaster since the BP oil spill. Nearly 3,000 families in the community of Porter Ranch have been relocated into temporary housing. California Governor Jerry Brown declared a state of emergency in the area last week. Methane is a powerful greenhouse gas that accelerates climate change 86 times more than carbon dioxide. At its peak, the leak has spewed the equivalent pollution of 4.5 million cars each day. On top of the impact to surrounding communities, the Porter Ranch leak has raised concerns about similar incidents across the state and around the country. There are 14 such natural gas storage facilities in California and more than 400 across the United States. Critics say they are plagued by ailing infrastructure and a lack of adequate regulation. We are joined by two guests: Tim O’Connor, director of the Environmental Defense Fund’s Oil and Gas Program in California, and David Balen, president of Renaissance Homeowners Association, located just outside of the well site. AMY GOODMAN: Coming up, health and environmental experts are accusing the Obama administration of caving to the meat industry in its new dietary guidelines. The guidelines recommend consuming less sugar, but they don’t recommend eating less meat. Does that have something to do with the massive lobbying campaign by the meat industry? Well, that’s coming up in our next segment—something to chew on. I’m Amy Goodman, with Nermeen Shaikh. This is Democracy Now! NERMEEN SHAIKH: We turn now to the latest in what’s being called the nation’s biggest environmental disaster since the BP oil spill. Today is day 84 of a runaway natural gas leak above Los Angeles that’s emitted more than 150 million pounds of methane. Nearly 3,000 families in the community of Porter Ranch have been relocated into temporary housing. Two schools have been closed. The exact cause is unknown, but it’s believed that well casing was breached deep below the ground. Adding to the confusion, the methane is invisible to the eye, so residents can’t see the fumes causing them headaches, nausea, dizziness and nosebleeds. This is Matt Pakucko, co-founder of Save Porter Ranch. MATT PAKUCKO: It’s just like in hell. I don’t know what’s going to happen day to day. I don’t know if I can work. I don’t know if I can breathe. When I feel sick, am I getting a cold, or am I like dying from this crap? It’s anxiety and apprehension all day, all day long. Can I go home? Should I leave? How—you know, well, you should see the stack of bills, of unopened mail, because I can’t pay them right now. Stuff is getting missed. My credit report is going pffft. NERMEEN SHAIKH: The company responsible, Southern California Gas Company, is digging a new well into the ground so it can pour in mud and cement to contain the old one. New figures from the California Air Resources Board show methane levels have declined since their peak in late November. But SoCalGas says it could take two to three months to stop the breach. California Governor Jerry Brown declared a state of emergency in the area last week. On Wednesday, California Senators Dianne Feinstein and Barbara Boxer asked federal officials to investigate the leak and see if there’s a faster way to contain it. The Los Angeles city attorney and Los Angeles County have filed a lawsuit against SoCalGas. AMY GOODMAN: Methane is a powerful greenhouse gas that accelerates climate change 86 times more than carbon dioxide. At its peak, the leak has spewed the equivalent pollution of 4.5 million cars each day. On top of impact to surrounding communities, the Porter Ranch leak has raised concerns about similar incidents across California and around the country. There are 14 such natural gas storage facilities in California and more than 400 across the U.S. Critics say they’re plagued by ailing infrastructure and lack of adequate regulation. For more, we’re joined by two guests. Tim O’Connor is with us, director of California Oil and Gas at the Environmental Defense Fund. And David Balen is back with us, president of the Renaissance Homeowners Association, located just outside of the well site. He’s also a member of the Porter Ranch Neighborhood Council and board member of the Porter Ranch Neighborhood School. Let’s start with Tim O’Connor. Lay out the scope of what has taken place so far. When we last talked about this with Erin Brockovich and David Balen, the governor had not declared a state of emergency. So, talk about what has happened since. TIM O’CONNOR: Well, of course, we know that this leak has resulted in a state of emergency, really since day one. And since the order by the governor, the pollution has just continued to spew out of the well, like a volcano, up above the community there. And even after being reduced by over 60 percent, this still has the climate change relevance and significance of having more pollution than all of California’s oil and gas production emissions combined. It’s really quite phenomenal. NERMEEN SHAIKH: —on the Porter Ranch community? AMY GOODMAN: Well, seems like we just took a hit on our Los Angeles satellite. We’re talking to Tim O’Connor of the Environmental Defense Fund, and we’ll also turn, in just a moment, to David Balen, who is one of the residents of the area. But let me turn to what state senator of California, Fran Pavley, said in a news conference during which she announced a new legislative package to tighten regulations on California’s natural gas industry in the wake of the methane leak. SEN. FRAN PAVLEY: One of our goals is just two simple words: “never again.” How can we make sure that this kind of tragedy doesn’t happen again? Today we’ll be proposing an urgency legislation to impose a moratorium on new gas injections and restrictions on vintage wells into the Aliso Canyon storage facility, until state agencies—by that I mean DOGGR, the CPUC and the CEC—and outside independent experts determine the site can be safely operated, and especially those older 1950s wells, make sure they do not pose a risk to public health and safety. AMY GOODMAN: That’s California state Senator Fran Pavley. Tim O’Connor, can you respond? TIM O’CONNOR: [inaudible] this facility safe, if it’s going to continue to be used. And we know that this facility, though, is just one of over 400 in the United States, and the business model has been to really not regulate these effectively until catastrophe strikes. We’ve got a huge catastrophe here in California, and we just can’t let these things leak methane and other pollutants into the air. It’s too important of a climate and too important of a public health issue. AMY GOODMAN: David Balen, talk about what’s happened since you were last on. You weren’t being relocated. Describe the scene on the ground with you and your neighbors. DAVID BALEN: Absolutely. Just recently, just last week, we were finally approved for relocation. My family and I are looking forward to moving into a new home and getting out of the contaminated area. It’s been quite trying for my family, as well as the other families throughout the community. You know, the neighborhoods are decreasing in numbers of people residing within the community. But we—on the other hand, we have, you know, large police out patrolling the area to keep the community safe. AMY GOODMAN: In response to the proposed legislation, SoCalGas issued the following statement: quote, “The initiative announced [today] by Sen. Pavley and other legislators represents the start of a legislative process. SoCalGas appreciates the legislators’ interest in the topic and looks forward to participating in the public discussion. As we have since this incident began, SoCalGas stands willing and ready to cooperate with the Governor’s office, all state and local officials, and regulatory agencies.” David Balen, do you think they’re—do you believe them? DAVID BALEN: I was—I hope that’s true. I really do. I feel that they’ve—they’ve overcome to this issue. I mean, they’re caught in this—they’re caught in this turmoil. They need to get out of this situation as fast as possible. This is definitely causing the community grief. So, yeah, I do believe that. NERMEEN SHAIKH: And, Tim O’Connor, could you respond to how SoCalGas has responded to this leak? TIM O’CONNOR: Well, I think it’s amazing, and also quite telling, that when we look at this company and this facility more broadly, we see things that are quite troubling and really symptomatic of the oil and gas industry across the United States. We have a major infrastructure problem. And over time, we’ve left it up to oil and gas companies to take care of infrastructure and to prevent leaks and to prevent integrity problems from arising. And this leak is just one example of what happens when infrastructure starts to fail. In fact, when inspectors went out on the site, they found 15 other wells that were leaking methane. And that was after this started. After the facility was under the microscope, its inspectors still went out and found many, many more leaks. We think that this is a problem in California and across our nation, and we need much tighter regulations and standards on facilities like SoCalGas. AMY GOODMAN: Tim O’Connor and David Balen, we want to thank you for being with us. Tim O’Connor, Environmental Defense Fund; David Balen, Porter Ranch resident. We’ll continue to follow what’s being described as the worst environmental disaster since the BP oil spill. When we come back from break, we’ll talk about the new dietary guidelines. What are they recommending? What they have remained silent about? Stay with us.